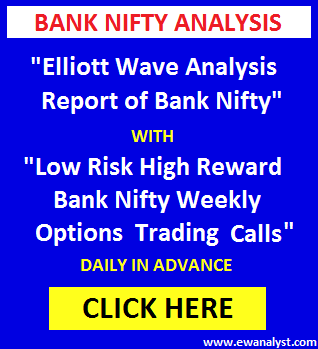 Bank Nifty opened flat at 28348, declined sharply just after opening to register low 28132 and bounced back again by more than 200 points to register new all time high 28378 but didn’t sustain at higher and declined back again to register day’s fresh low 28087 and finally closed 195 points down at 28124. Friday, further bounce for new all time high towards 28486-28529 was expected either from present level or from 28213-28139 range in coming days. 28116 was the pattern negation point on downside. Trading strategy was to buy 28500 Call of 30 Aug expiry if Bank Nifty gets in 28200-28139 range with exact stolposs of 28114 expecting minimum 28486-28529 in coming days. Bank Nifty entered in 28200-28139 range and bounced sharply by 178-240 points till 28378 but declined back again to register low 28087. Trade was giving 170-240 points profit [more than stoploss] but decline back and stoploss was trigged. Now, we need to analyze fresh charts to calculate further move. This is Daily time bar chart of Bank Nifty which I am expecting as start of wave  (explained in my all time frame report). Wave [v] achieved 38%-61% projection after breaking above 28296 whereas next 100% projection is placed at 31197 which may or may not be achieve. 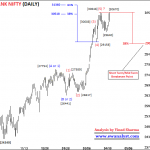 Bank Nifty achieved 28378 till now. 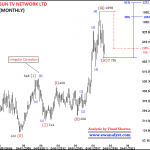 Now, we need to analyze wave [v] started from 23605 on separate lowest time frame chart to calculate its inner waves. This is 5 Hourly time bar chart of Bank Nifty covering bounce from 23605 which I had marked as start of inner wave [v] of wave  on the previous chart. It seems wave completed at 24651 may be wave (1) of [v], wave completed at 24087 may be wave (2), wave completed at 27164 may be wave (3), wave completed at 26060 may be wave (4) and wave (5) may be in progress. Wave (5) achieved 38%-61% projection after breaking above 28259 and next 100% projection is placed at 29619 which may or may not be achieve. 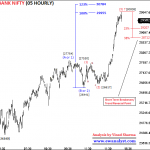 Bank Nifty achieved 28378 till now. 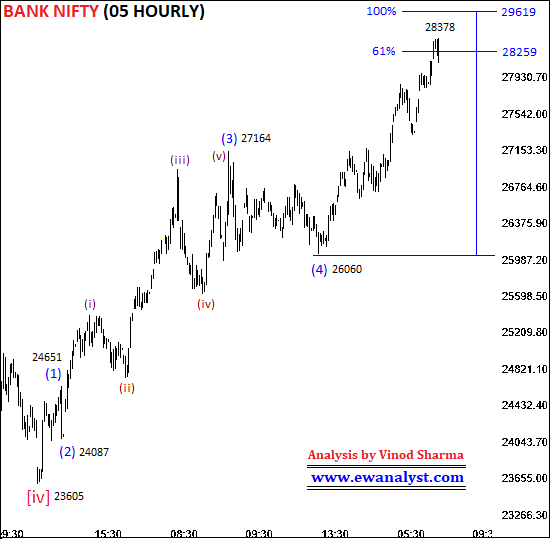 This is Hourly Minute time bar chart of Bank Nifty covering move from low 26060. This bounce I marked as start of wave (5) as marked on 05 Hourly chart. 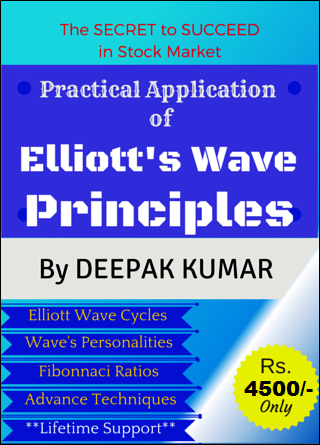 Wave completed from 26060-27164 may be wave (i) of (5), wave completed from 27164-26671 may be wave (ii) and wave (iii) may be completed at 28378 or still in progress. 23%-38% retracement of progress of wave (iii) is placed at 27975-27725 which is the short term support range on downside and same 27725 is the short term breakeven point on downside. 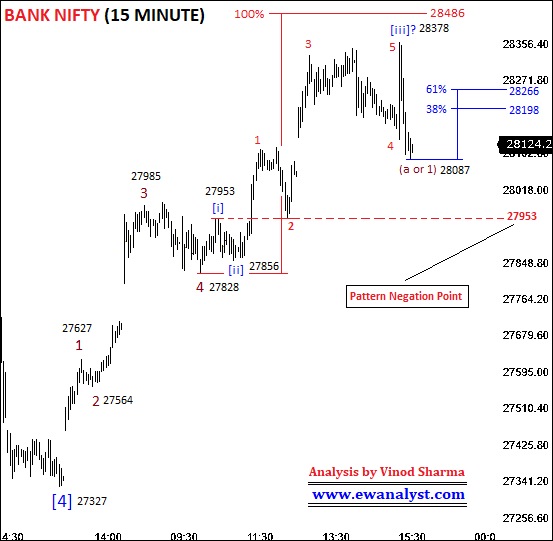 Within wave (iii), it seems wave  may be completed at 27124, wave  may be completed at 26868, wave  may be completed at 27873, wave  may be completed at 27327 and wave  may be completed at 28378 or still progress. Wave  achieved normal 61% projection after breaking above 28069 whereas next 100% projection is placed at 28529 which may or may not be achieve. 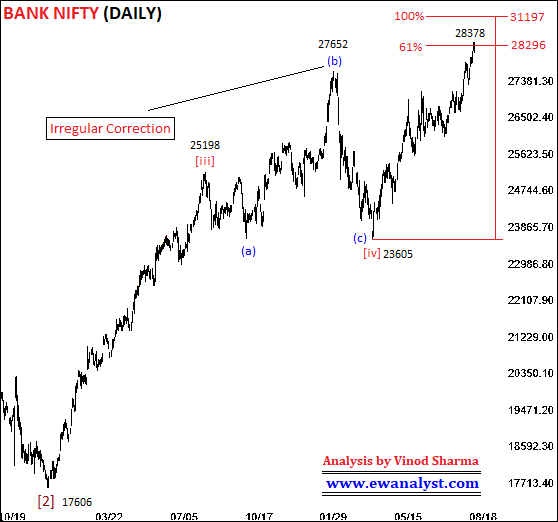 Bank Nifty achieved 28378 till now. Now, we need to analyze wave  of (iii) started from 27327 on separate lowest time frame chart to calculate its inner waves. This is 15 Minute time bar chart of Bank Nifty covering move from 27327 which I am expecting wave  of wave (iii) on previous chart. 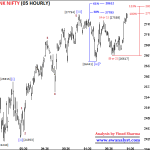 It seems wave completed at 27627 may be wave 1, wave completed at 27564 may be wave 2, wave 3 may be completed at 27985, wave 4 may be completed at 27828 and wave 5 may be completed at 28378 or still in progress. Wave 5 achieved 61% projection after breaking above 28234 and next 100% projection is placed at 28486 which may or may not be achieve. Within wave 5, it seems inner wave [i] may be completed at 27953, wave [ii] may be completed at 27856, wave [iii] may be completed at 28378 and wave [iv] or [v] may be in progress. 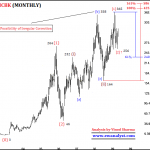 Wave [iv] retraced deeper than 38% which was placed at 28167. The decline from all time high 28378-28087 is sharp and looks impulsive and this impulsive decline can be assumed as wave (a or 1). So, 38%-61% retracement of wave (a or 1) is placed at 28198-28266 which is the immediate resistance but this is just indicative resistance range because we are not confirmed if wave (a or 1) is completed or still in progress. This resistance range will change if Bank Nifty decline below 28087. For short term, Outlook of Bank Nifty is still positive for short term but inner waves as achieved all its normal projections, even some waves are highly extended. So, there is a possibility of small/big correction towards short term support range before further bounce. 27975-27725 is short term support and 27725 is breakeven point on downside. Any bigger reversal can be expected after breaks below 27725 only. Generally, Bank Nifty is expected to register one more high above 28378 without breaking lower below 27725 but we need confirmation from the pattern of correction. 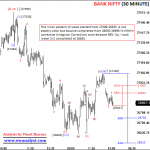 The support range 27975-27725 is big [250 points], so exact range can be calculated after seeing pattern of correction. We need to keep all these conditions in mind while deciding next trade. 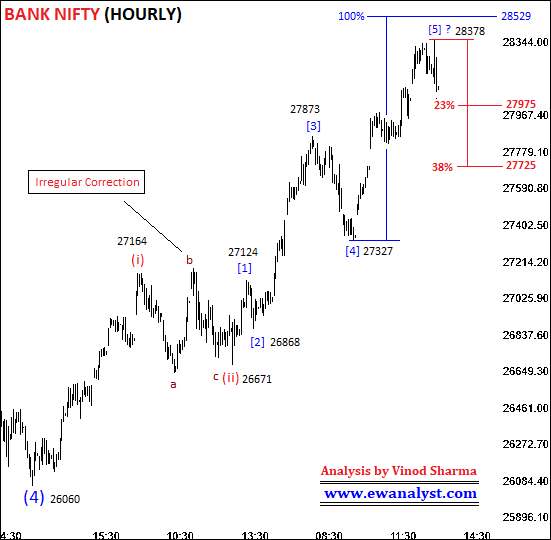 Bank Nifty if completes corrective pattern around 27975-27725, then it will be a good buying opportunity for bounce above 28378 but the exact low risk trade can be decided after seeing the pattern of decline only. So, we need to wait for the decline towards 27975-27925 for confirmation. On downside, the decline towards 27975-27725 is possible but the decline from top is sharp till now. 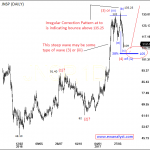 So, we need to wait for upside corrective pattern [wave (b or 2)] to sell confidently for sharp wave (c or 3) downwards. 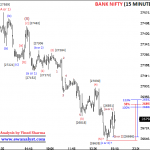 Overall, Bank Nifty is at a point where we need to wait for the formation of upside or downside corrective pattern to decide further trade confidently and generally I prefer to wait for fresh trade in such conditions. Otherwise, traders can plan their own trade based on the conditions explained above.